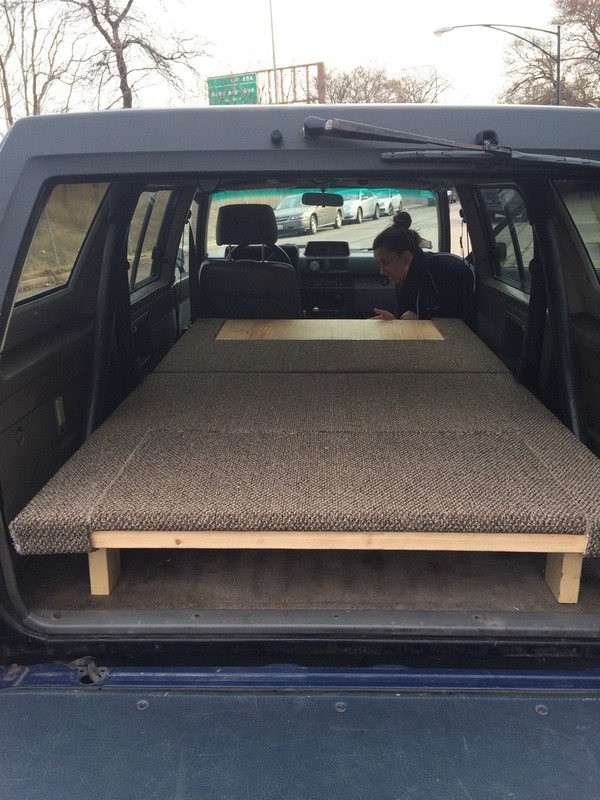 A sleeping platform is a relatively common modification for those who do any camping in their truck. If the weather is bad or we're just feeling to lazy to set up a tent, it'll be nice to be able to pass out back there. It also give us a secure place to store all of the Baja sweatshirts we'll be picking up along the way. - Something that could be broken down and removed easily so that the back seats could be put in again later. - Long enough so that my 6'1" frame could fit inside with the tailgate closed. - I'm no carpenter, so it needed to be kinda simple. Access panels at the front and back so we could you know, access stuff. Could be broken down and removed easily so that the back seats could be put in again later. Long enough so that my 6'1 frame could fit inside with the tailgate closed. Didn't require removing the rollbar- with the rollbar out, we would have been able to slide a full sized 48" wide sheet of plywood. With the rollbar left in, we had to cut the plywood to 46". The 2" difference didn't seem worth the loss of safety. Simple. Sure, I got my Cub Scout carpentry badge (I hear they're still talking about my two story trapdoor birdhouse), but I'm no Bob Villa. Or Bob Sagat, who could also probably build a better sleeping platform than me. So, armed with some measurements and a few pictures, I set off to The Crafty Beaver, our local hardware and lumberyard. Here, I have to give John from the Crafty Beaver a big digital high-five. When I first started to tell John, about what I wanted to build, I was concerned he wasn't quite getting it. Before John, the manager almost paired me up with Rob, but Rob was slow coming up and the manager just nodded said, "I guess John here could help you." As I showed John, pictures of some examples and described the trip and what I wanted the platform to do, John kept shifting his weight from one foot to another with increasing speed. He just kept saying, "yeah, yeah, uh-huh, uh-huh." I started wondering if maybe Rob should have been the guy for the job. When I finally put away my poorly drawn sketches, and asked John what he thought, John, with a gleam in his eye said, "That's awesome. I built the same thing in my van 30 years ago. I know exactly what you need." 45 minutes later I had my design, my lumber and all my hardware. 4x8 3/4" piece of Plywood, cut into two sections of 40x46 and 30x46. Assorted wood screws and bracing plates. Also a few pics of the carpeting and "Packing Test 1." Hooray!